2. Allah is. Beside Whom none is to be worshiped. Self-Living, Sustainer of others. the severe torment and Allah the Mighty, is Possessor of the power of retribution. worshiped the Dominant, the Wise. and none accept admonition save men of understanding. Yourself; no doubt, You are the big Bestower. the promise of Allah changes not. it is they who are the fuel of the hell. and Allah's punishment is severe. forgiveness in the latter part of the night. standing with justice; none is to be worshiped save He, the most Reverend, Wise. doubt Allah is to call to account very soon. Allah is seeing His bondsmen. good tiding of painful torment. judge between them, then a faction of them turns away being opposed to it? the lies which they used to invent deceived them in their religion. paid in full what it has earned and they shall not be wronged. hand is all good. No doubt You can do all things. service. There fore accept this from me, no doubt, You alone are Hearing, Knowing. her Mary, and I give her and her off-spring under Your protection from Satan the rejected. the guardianship of 'Zakaria'. Whenever Zakaria went to her place of prayer, he found new provision with her. 40. Said, 'O my Lord! From where shall I have a son, while the old age has reached to me and my wife is barren'. Said, 'Allah does so whatever He pleases'. from amongst the women of all worlds'. 43. 'O Mary! Stand before your Lord humbly and prostrate for Him and bow down with those who bow down. a way what He pleases". When He decrees any thing, then He only says to it 'Be! And it is. great sign for you if you believe. they shall have no helpers. 60. 'O Listener! This is the truth from your Lord; be not therefore of doubters. but after him, then have you no reason? you have no knowledge, and Allah knows and you know not. and the believers, And Allah is the Protector of the believers. and they have no sense. 70. 'O people of the Book! Why do you deny the signs of Allah, whereas you are yourselves witnesses. morning and deny at evening; perchance they may return'. and Allah is All-Embracing All-Knowing. responsibility over us in the matter of illiterates. And they utter a lie against Allah knowingly. purify them; and for them there is painful torment. forge a lie against Allah purposely and knowingly. infidelity after it that you have become Muslims? 'We did affirm, He said, 'then be witness against one another and I am myself among witnesses with you. and the earth, willingly and unwillingly, and to Him shall they be returned. have bowed down our necks. world he shall be among the losers. Messenger is true and to whom had come clear signs? And Allah guides not a people unjust. accepted and these are they who have gone astray. Taurah wee sent down. Say you, bring the Taurat and read it if you are truthful? was not of the polytheists. blessing and a guide of all world. then Allah is independent of entire world. desire to crook it and you are yourself witness thereof? And Allah is not unaware of your doings. 100. 'O believers! If you obey some of the people of the Book, then they would render you infidels after your belief. come the Messenger of Allah? And he who sought the support of Allah has been directed to a straight path. 102. 'O believers! Fear Allah, as rightly He is to be feared, and do not die ever save as Muslims. it; Thus Allah explains to you His signs; that haply you may act guidance. forbid evil. And the very same attained to their goals. signs had come to them and for them there is mighty torment. Muslims and most of them are infidels. again they will not be helped. because they were disobedient and transgressors. hours of night and prostrate. men of hell and shall abide therein. them not, but yes, they wrong unto their own souls. breasts is yet greater. We have made you hear Our signs clearly, if you have wisdom. wrath. Say you, die in your passion' Allah knows well the thoughts of the hearts. their positions for battle. And Allah is All-Hearing All-Knowing. send five thousand angels with marks for your help. is no help except from Allah, the Dominant, the Wise. torments whomsoever He pleases; and Allah is For giving Merciful. is already prepared for those who are pious. 134. Those who spend in the path of Allah in prosperity and adversity and who restrain anger and who pardon men. And virtuous people are dear to Allah. remain for ever therein, and what an excellent reward is for workers. end of the beliers! (Who did deny)? and may assign some of you the position of martyrs. And Allah loves not the unjust. neither has experimented the steadfast? all. And very soon Allah will recompense the thankful. of this, And it is very soon, We may recompense the thankful. faced in the path of Allah, and neither became weak nor gave in. And the steadfast are dear to Allah. affairs, and make firm our steps and help us against these disbelieving people. sent down not any understanding and their abode is Fire, and what is the evil abode of the unjust. purge it. Allah knows the thoughts of your hearts. because of their certain actions, and surely Allah forgave them. Verily, Allah is Forgiving, Gentle. regret in their hearts. And Allah gives life and causes death and Allah is seeing your works. better than their entire wealth. in Allah. Undoubtedly the trustful are dear to Allah. again. And Muslim should have trust unto Allah alone. and there shall be no injustice unto them. hell? And what a bad place of returns it is. before that they were certainly in apparent error. to say, "Whence it came". Say you; 'It is from your own side'. Undoubtedly Allah can do everything. not in their hearts. And Allah knows what they are concealing. successors who have not yet joined them that on them there is not any fear, nor any grief. reward for their righteous and reverent people. 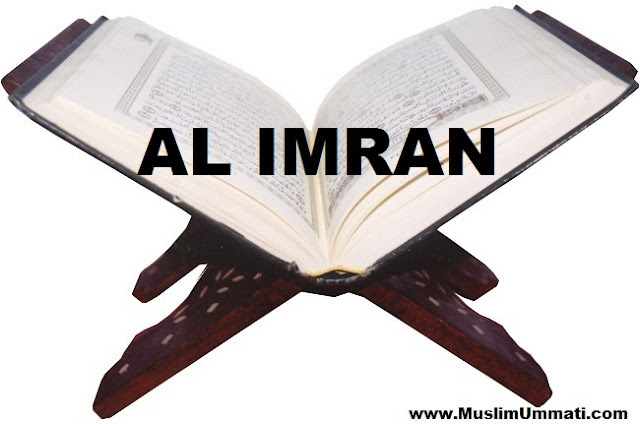 their faith and said, 'Allah is sufficient for us and what an excellent Disposer of Affairs. of Allah. And Allah is of great, Bounty. intends not to assign any position for them in the Hereafter and for them, there is great torment. We grant them respite only because they may further increase in sin. And for them is the degrading torment. and His messengers. And if you accept faith and fear, then there is great reward for you. and with this order which you speak of, then why did you kill them, if you are truthful? the scriptures and the shining Book have already been belied. 185. Every soul is to taste the death; and you will get your compensation in full only on the Day of Resurrection. world is but the goods of deception. endure and guard yourselves (against evils), then it is the work of strong determination. Exchange of it, then how an evil Purchasing it is! of such people away from the torment and for them is the painful torment. signs for men of understanding. 192. 'O our Lord! Verily whomsoever you cause to enter the Hell, him You have surely humiliated, and the unjust have no helpers. 193. 'O our Lord! We heard a proclaimer that he calls for believing, that believe unto your Lord; then we believed. O our Lord! Forgive us our sins and wipe off us our evils and cause us to die along with the righteous. 194. 'O our Lord! And give us that what You have promised to us through Your Messengers; and disgrace us not on the Day of Resurrection. Undoubtedly You do not break the promise. 196. 'O Listener! Let not deceive you the strutting about of the infidels in the cities. 200. 'O believers! Be patient, and excel in patience with the enemies and guard Islamic country on the border and remain fearing Allah that haply you may be successful. An Islamic Blog for Building The Strong Relationship of All The Muslim Around The World.